Electronically tested 925 silver ladies cast & assembled ruby and white sapphire pendant with chain. 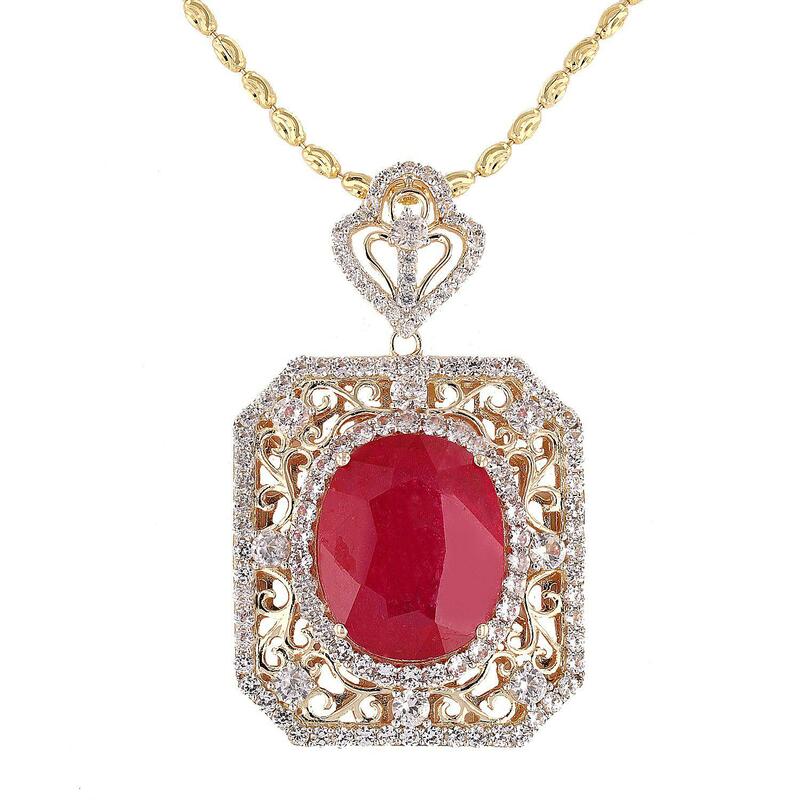 The pendant features a ruby set within a stylized white sapphire set lattice, completed by a white sapphire set bail. The pendant is supported by an eighteen inch length 925 silver link chain with a yellow gold overlay, terminating in a lobster claw clasp. Bright polish finish with a yellow gold overlay. Trademark is Orianne. Identified with markings of "925". Condition is new, good workmanship. One prong set oval mixed cut natural ruby approximate weight of 25.13ct., clarity is heavily included, type II, medium dark, very slightly brownish, slightly purplish red color, (GIA slpR 6/3), cut is good. Transmitting light somewhat diffusely, transparent to translucent. Naturally occurring internal & external characteristics are present. Indications of laboratory high temperature heat treatment, with glass & flux additives. Graded in the setting. Ruby has a low tolerance to rhodium plating, repolishing the surface, & ultrasonic cleaning. One hundred twenty-two prong set round mixed cut natural white sapphires approximate total weight of 6.94ct., clarity is eye clean, colorless, very slightly grayish, white color, (GIA W 0/3), cut is good. Transmitting light with no distortion, transparent, Color grade is an average for the group, Graded in the setting.